By definition, heroines are women who are admired and emulated for their achievements and qualities. In all of our lives, there are women who fit this description. One of them may be your grandmother, mother, sister, wife, or daughter ... your teacher, friend, or mentor ... or your source of inspiration. We show appreciation for the women most important to us in very personal ways - a kind word, a thoughtful note, a special gift. Yet time and distance may make it difficult to fully acknowledge their impact on our lives. Rarely do we have the opportunity to honor women publicly and to celebrate their lives permanently. Now you can honor your own heroines in a lasting and public way in the heart of Wichita State. Bricks and granite, plants and light come together in a circular space surrounding a striking sculpture of bronze. The Plaza of Heroines is a haven for contemplation and a gathering place for celebration. In the Plaza, engraved bricks, granite paving stones, and sweeping granite benches permanently record the names of the women being honored. Individuals, families, associations, businesses, and organizations - regardless of affiliation with WSU, all are welcome to pay loving tribute to women they wish to recognize as heroines. Rees, Lillie M., 95, of Pensacola, FL, formerly of Wichita, died July 1, 2015, surrounded by family. 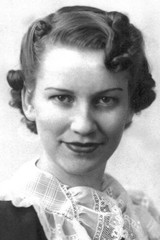 Born in Sedan, KS in 1920, she was the 4th of 12 children to Clarence Levi Cobler and Anna Belle Marken. Education for women was always important to Lillie. Lillie left home after the 8th grade to help support the family. Through the kindness of others she was able to earn her diploma at Seaman Rural High School in 1938. Lillie realized her dream of becoming a nurse at the age of 59, and then worked as a school nurse and home health nurse in Chicago, Topeka, and Wichita. Married to Frank in 1947. She is preceded in death by her husband, Frank in 1999; and sons, Douglas in 2006. Survivors include son, Jerry (Sallie) Rees of Leawood, KS; daughter, Janice (Barry) Arbuckle of Wichita; daughter-in-law, Zenaida Rees of Pensacola. Lillie was very proud of her 8 grandchildren and 6 great-grandsons. Celebration of Life at 3 p.m. Saturday, August 1, at First MB Church, 8000 W. 21st St., Wichita. Memorials established with First Christian Church, 6031 Goodrich Drive, Pensacola, FL 32504, or WSU Center for Women's Studies.